New South Wales will host three matches – including a game against the HSBC Waratahs and the third and final Test – when the British and Irish Lions make their long-awaited return to Australia with a tour in 2013, the Australian Rugby Union confirmed today. The Lions will play a Combined Country team at the Ausgrid Stadium in Newcastle on Wednesday, 12 June. Country will be the only non-Super Rugby team afforded the opportunity of playing the Lions in their six additional matches outside the three-Test series. Three days after taking on Country, the Lions will play the HSBC Waratahs at the Sydney Football Stadium. The June 15 showdown will be the first time the two sides have met since June 2001, when the Waratahs recorded a 41-24 victory. The Lions will return to Sydney three weeks later for the final Test of the series – and the last game of the five-week tour – when they take on the Qantas Wallabies at ANZ Stadium. 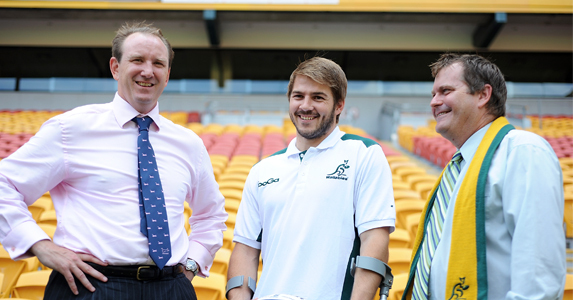 The news that the state will host three games has been warmly welcomed by the NSW Rugby Union and Waratahs Rugby. Past Lions’ tour schedules have always included a match against NSW Country. In a break from tradition, in 2013 the visitors will take on a combined NSW and Queensland selection. “This match will see the very best amateur players up against one of the most professional touring sides in the world and it provides a great opportunity to showcase Country Rugby,” said Worboys. On the 2013 Tour, the Lions will play nine matches around Australia, with three set down for NSW under a long-term deal between the ARU and the State Government through Destination NSW. The centrepiece of the deal is playing a Bledisloe Cup Test in Sydney each year from 2012 to 2021, but the arrangement also includes three Lions matches in 2013. The tour will open with a match against the Western Force in Perth on Wednesday, 5 June, and ends with the Third Test in Sydney on Saturday, 6 July. “The Lions tour here in 2001 was an extraordinary event and one which provided significant economic benefit to those cities which hosted major matches,” said ARU Managing Director and CEO John O’Neill AO. “More than 8000 Lions supporters came to Australia from the UK and Ireland on official tour packages and many more thousands made their own way here. Before arriving in Australia for their nine-match Tour, the Lions will kick off their campaign with a match in Hong Kong against the Barbarians on Saturday, 1 June.